Advanced Post/page options – custom background color/image, custom colors, custom layout (right sidebar, left sidebar, full-width), hide/show elements, page comments, and more ? This demo will be reset everyday, any content that is offensive will be deleted. 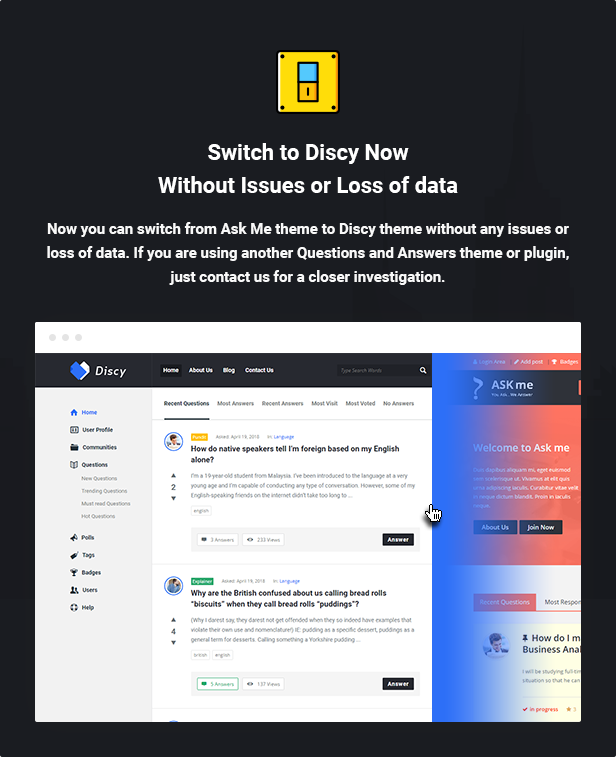 You can use it to test the features and content of the Discy theme like ask question, answer and every other things in the theme. 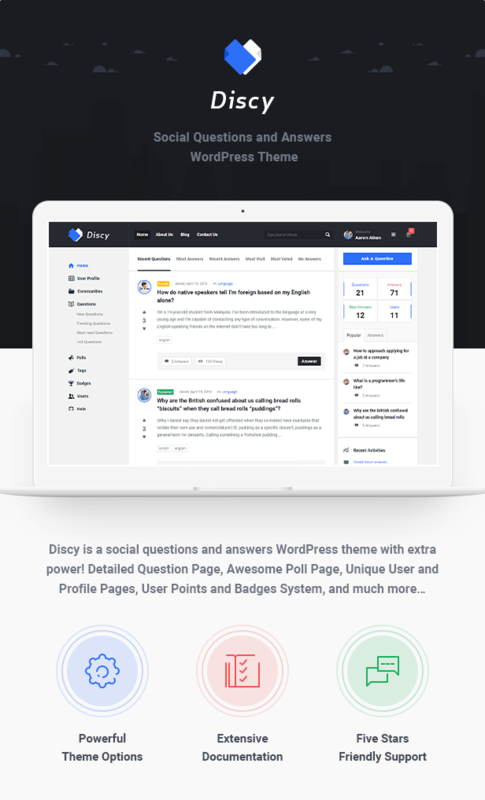 Discy is super easy to install and setup and come with an extended documentation, ready to use page layouts and examples, and much more. We provide professional theme customization service for our themes. Kindly send me here your requirements and we will respond with the cost. Note : If you buy the theme and want the demo files please send me in my profile. - Add a new option to sticky the questions. - Add a new option to can pay to ask with PayPal. - Add a new option to active PayPal sandbox or not. - Add a new option to choose your currency. - Add a new option to add your PayPal email. - Add a new option to add the PayPal identity token to make the payments work. - Option to choose what’s the groups you need them not pay when ask question. - Add a new option to add the price for the ask question. - Add a new option top active pay to sticky the question or not. - Add a new option to add the price for the pay to sticky question. - New option to choose what’s the days active the sticky question when someone made a payment. - Add a new option to active the coupons at the site or not. - Add a new option to show the free coupons when you have any one. - Add your coupons with discount or with percent and choose the expiry date or leave it empty. - Add a new page to show all the payments with your money. - Add a new icon at the WordPress bar to show the new payments. - Add a new link at questions page at the admin to show all the sticky questions. - Remove Excerpt type from all the theme and add it only at the Discy Setting at General settings. 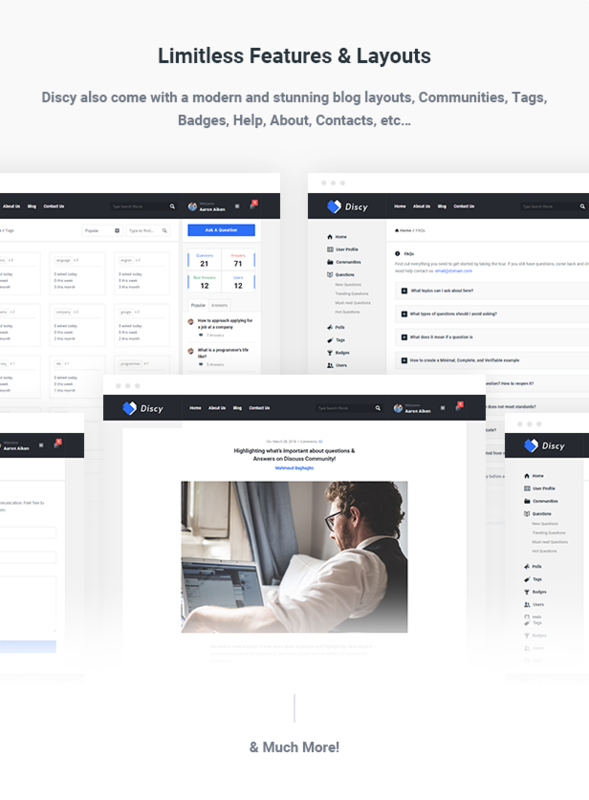 - Change the name for the login page template to landing template. - Add a new option to send email or not when some one add a question need to review first. - Add a new option to send email or not when some one add a post need to review first. - Add a new option to upload your custom logo when the emails sent from the theme. - Add a new option to add your sent email when the emails sent from the theme. - Make a new tab at Discy Setting to make your custom email templates, it’s 12 templates. - Add a new page template login. - Add a new meta for the questions to hide the author name or not. - Add a new option to verified the users when edit his profile from the admin side. - Improved the header responsive. - Add a new option to set the permission for the user groups to can upload files. - Add a new option to set the height and width for the logo. - Add a new option to active the WordPress editor for the comments and answers. - Add to the WPQA menu link to add the add question page and add post page. - Add a new option to set the left menu for the logged user only and the unlogged users. - Check with jQuery at answers and comments if you add all the require fields.